Cheapflights Chat is a Facebook bot. It uses the latest technology from Facebook to help you find flights and hotels in your Messenger app in a fun and conversational way. 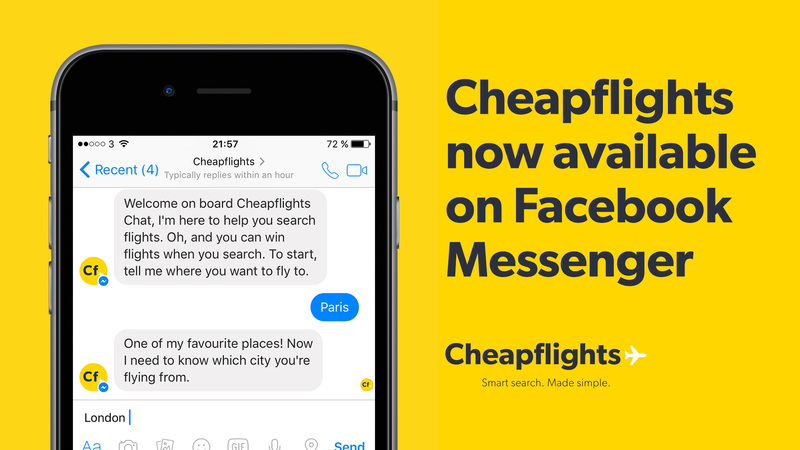 Cheapflights built the bot in a few weeks of Facebook announcing their Messenger developer tools. The aim was to create a useful travel tool that combined multiple benefits you would normally only get from downloading multiple apps. When Cheapflights Chat launched it was the world’s first Messenger bot to search for flights and hotels and utilised seven APIs. Cheapflights has always been a pioneering travel technology company, following a mobile-first strategy. Mobile is a key growth priority for Cheapflights — 63 percent of traffic and 54 percent of revenue now come from mobile. To use Cheapflights Chat, open Messenger and start talking to Cheapflights. Tell Cheapflights Chat where you want to go and it will give you the average cheapest return flight in the near future. For all the flight details just tap ‘book now’. If you ever get stuck just type ‘help’. If you’re after some winter sun, type “Where’s hot now”. Cheapflights Chat suggest flights to destinations where it’s above 21 degrees and under a five-hour flight time. If you’re not sure where to fly, just type “Inspire me” and Cheapflights Chat will suggest flights to some trending destinations. To engage users and keep a conversational style in line with Messenger, Cheapflights Chat uses artificial intelligence to create a natural-sounding language. There are also some engaging Easter egg responses to things like “I want to go to the moon”, “Are you real?” and “I love you”. To launch the bot, Cheapflights ran a competition-led social media campaign. The competition mechanic was built directly into the bot and promoted across Facebook. Whilst the competition ran, anyone who searched for a flight could enter the prize draw. 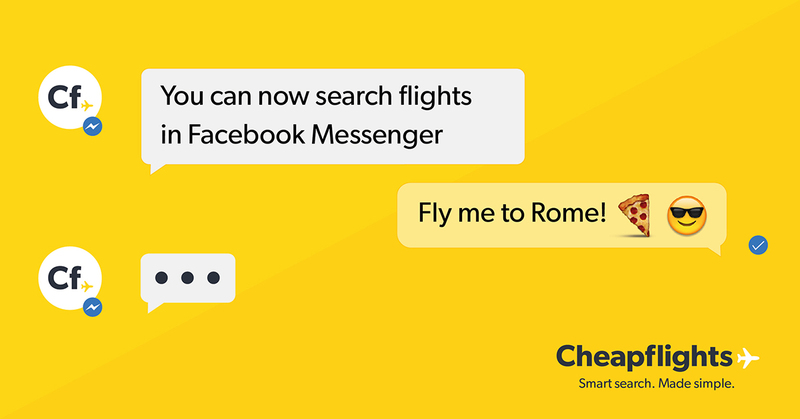 To promote Cheapflights Chat, videos of fictional conversations in Messenger were promoted across Facebook. Some advertised the flight search and some advertised the competition. Here’s one between the bot and a man called ‘John Snow’. Static banners like this were also used alongside the video ads to promote the bot on Facebook. The campaign launch generated over 20,000 Messenger conversations and 30,000 flight searches. The technology is still very new. Facebook describes the current period as a “test and learn phase”, even for themselves. They recently said there are currently around 30,000 Messenger bots out there, but very few have over 10,000 active chat threads. Cheapflights Chat has over 20,000 active chat threads (and is growing every day) converting into flight searches at 150% (compared to 37% on Cheapflights mobile site and 8.9% via Cheapflights app). Traffic generated from this campaign carried a 24% conversion rate which is 38 times higher than traffic from Cheapflights Facebook travel content posts. 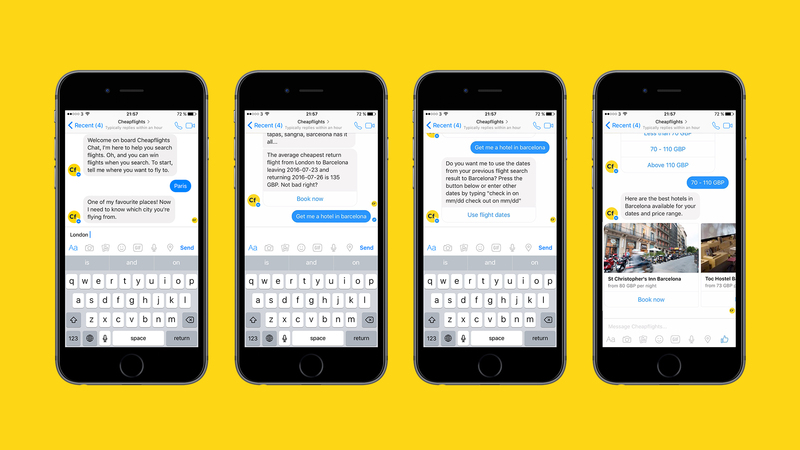 This level of adoption for such a new technology feature and the results demonstrated so far, place Cheapflights at the forefront of Facebook Messenger bot usage as well as demonstrating delivery on its promise of customer excellence. People are using it to perform travel search. During Q3 2016, Cheapflights mobile revenue grew 216% year-on-year. This was enabled by continuous mobile product and social media marketing innovation such as Cheapflights Chat Messenger bot. The bot provides Cheapflights with a scalable, automated and innovative way to execute flight searches and takes travel search and tools to customers on the apps they use the most. Facebook Messenger usage is expected to exceed two billion users by 2018. When you put that into the context of the world’s population and the results Cheapflights have seen in these very early days, Cheapflights believe bots are here to stay and will be a significant revenue stream moving forward.